Ibrahim is 11 years old and he’s developing his own personality, which is at once familiar and also uniquely his own. Sometimes when I look at him, I recognize an expression on his face, the curve of his jaw, the sweep of his hair. He looks a lot like my husband. My 14-year-old son, Mustafa, looks a lot like me. Even their personalities match up. Genetics are uncanny. Every parent has a favourite age. Mine is the age Ibrahim is at right now — tweens are my jam. They can be worldly, but still innocent and naïve. They’re curious about the world, without being cynical or moody like teenagers. They’re also pretty funny, sometimes even on purpose. It’s been fun watching my kids come into their own, as they leave their childhood behind. I’ve enjoyed discovering the people they are turning out to be. Watching my kids evolve is one of the perks of parenting. Especially since I don’t have to leave my house or put on fancy pants to do the observing. Recently, though, I’ve had the tables turned on me. Ibrahim, on top of developing into a funny, quirky, witty tween, has also settled on some decided opinions. Which he has decided to share with the readers of this column. 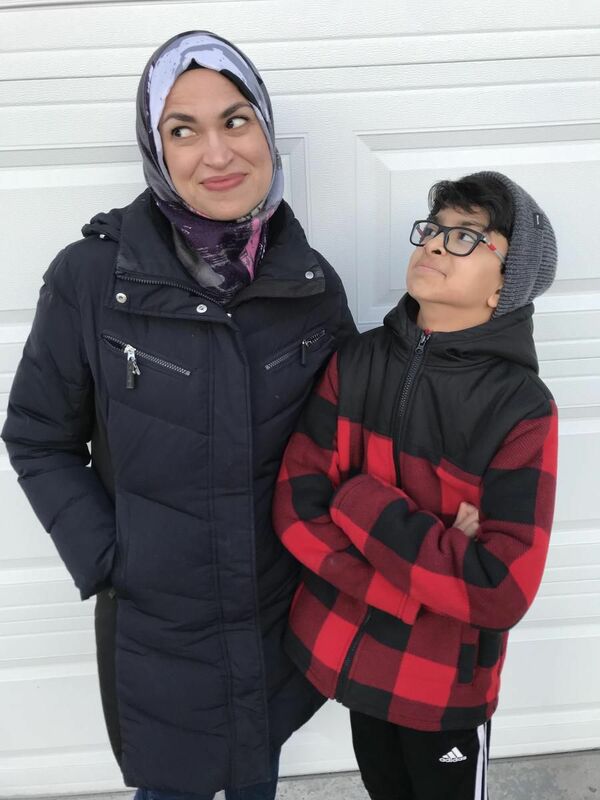 Below, in his own words, are Ibrahim’s thoughts on me as his mother, and some advice on how to handle being the child of two busy working parents. Enjoy! Hi, my name is Ibrahim Merchant, and many of you may know me as the son of Toronto Star columnist Uzma Jalaluddin. Well, I am here to tell you about my mom’s real life. Trust me, this is going to be good. Sure, she does all of those things, but the way I see it is, she doesn’t spend enough time with me. That’s because she’s always on the phone with her writer friend, S.K. Ali. Don’t get me wrong, S.K. Ali is very nice and super friendly. But my question is: Why can’t I be her writer friend? Sometimes when I come home from school, my mom’s not there because she’s at a book club or author event or doing an interview. I know all of this stuff is really important, but what about me? I could interview her. We could have a book club. I mean, everyone reading this right now, you probably think I’m a good writer, right? I’m pretty sure I’m her best friend, too, so there’s really no reason for her to go out when I’m already here at home. OK, to be honest, my mom and I do a lot of things together. She plays the obstacle course game with me, and we also go tobogganing, and all of that is fun. I can also say I am more fun than my brother, Mustafa, who doesn’t play with us anymore because he is too cool. Actually, I think the real reason is because he’s too boring. The bottom line is, it’s really hard to have a Mom with three jobs, but I am proud of her for all the hard work she has done to get this far. So here’s my advice to all the kids out there, whose parents are busy working one, two, or three jobs, like my mom: Make them feel guilty, because that’s how you get extra birthday presents. 1. Try to take up a hobby because it will keep you busy. Like for instance, I play the piano. I have an excellent teacher, so make sure you get one too. Or you could grind a video game, like my brother does. But parents, beware if your child takes up video game grinding, you’ll have to pry the controller from their hands when you want them to do something productive! 2. If one parent is busy, try to spend time with the other parent, or another relative like your grandparents. My dad and I have started to play catch more often, and I visit my grandparents every weekend. 3. Keep track of all the times your parents neglected you because they were “too busy working.” Bring this up when you’re older and your parents complain that you’re too busy to FaceTime them. All kidding aside, I really hope you treasure every moment of the time you do get with your parents. I also hope you learned something from my article, and most importantly, that you enjoyed this break from my mom’s usual stuff.